This curious song, I would venture to guess, comes from a musical play of the turn of the 20th century. It starts off as a critique of money (“Dos shtikele papir” – “that little scrap of paper”) but then becomes a quick review of how to keep a kosher home. It seems to address two separate aspects in the plot of a play. 100 Karbovantsiv note from the short-lived Ukrainian National Republic, 1917. Note the Yiddish text at bottom. Khave Rosenblatt is a wonderful singer and her style of performance reinforces the probable theatrical connection with this song. She sings in her Ukrainian Yiddish dialect that is called “tote-mome-loshn” [father-mother-language], because the “a” sound becomes “o”. For example in the first line she sings “faronen” instead of “faranen”. As always in this blog her dialect is reflected in the transliteration, not the Yiddish transcription. 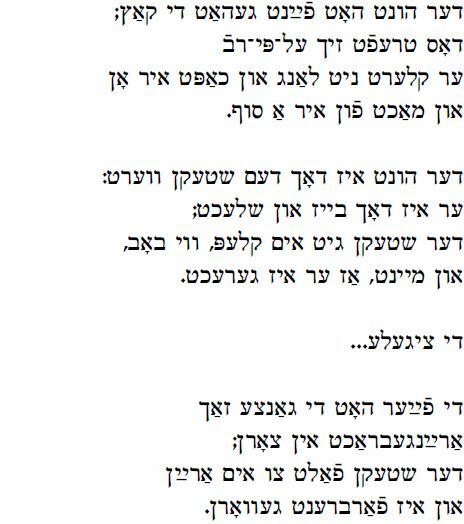 A reader asked Chana and Yosl Mlotek about this song in their Forverts column Leyner demonen zikh (Readers Remember) on June 23, 1974 but they could find no additional information. The reader remembered only the first four lines beginning with “Her oys mayn zun” (“Listen my son”). In the original recording, Rosenblatt says before she sings that “the song is known, but I have never heard anyone sing it”. 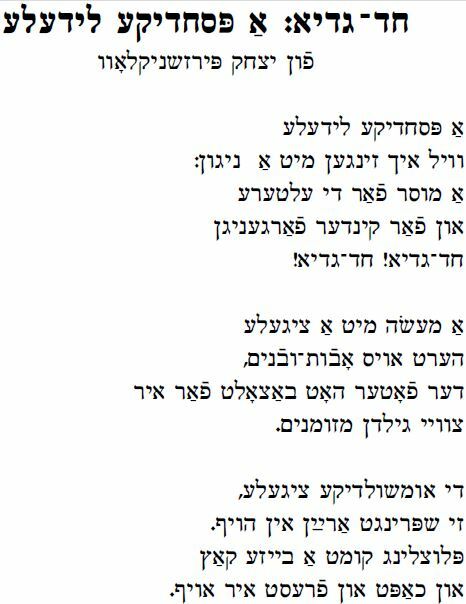 Rosenblatt also sang this song for Barbara Kirshenblatt-Gimblett and that recording is found on the website of the National Library of Israel (listen for the first song at 2:16). Special thanks for this week’s post to David Braun for help in deciphering the text. Se git a numen urem in gevir. Derkh dir harget eyner ’em tsveytn. In derkh dir kriminaln, arestantn in keytn. derkh dir geyt eyner di moske farkert. Oy, zey man kind, zolst dikh firn bikshire. in nit tin vu’ di vilst. in zolst nit ganvenen keyn gelt. oyf deym ribl freygt keyner keyn shales. in me zoltst es oys. A ey mit a blitstropn varft men aroys. Se zol in deym ribl keyn fremder blitstrop aran. a little piece of paper. It marks the poor and the wealthy. the wise into crazy ones. and because of you criminals, convicts walk in chains. the eyes are rolled up, the shoulders hunched up. that little piece of paper. Oh, see my child, that you should lead a proper life. nor walk around with a God-fearing mug. and don’t do whatever you want. and don’t steal any money. and from kosher something unkosher. but about the heating stove, no one ever asks any questions. Meat should be soaked and salted. An egg with a blood drop should be thrown out. So no outside blood drop should fall into it. During a break in the KlezNorth Festival in England, March 2014, I recorded on video a Yiddish version of Khad Gadyo from Pam Singer. As she says in the video, she learned the song in I. L. Peretz Shul in Winnipeg in the early 1960s. She remembers half the song (see the end of this posting for all lyrics). In the comments to that previous post, Nadia Dehan from Paris pointed us to a printed version of the song with all the words in the Lider bukh: gezamlter repertoir fun Frayhayṭ Gezangs Fareyn (Chicago, Ill. 1923). Please note that all the Yiddish words that originate from Hebrew/Aramaic have been “Yiddishized” in this collection. 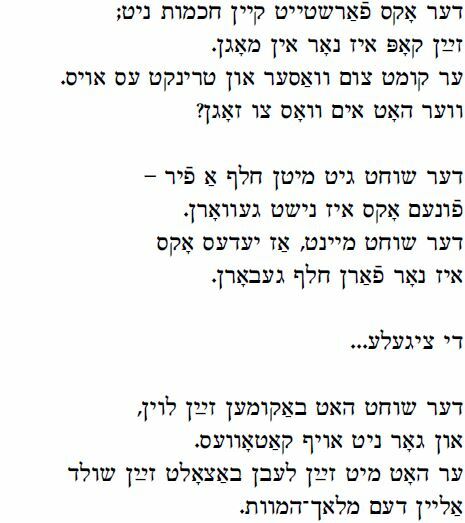 From the website of Zemereshet, זמרשת we learn that the song’s title is “Khad gadyo” and was written by a fascinating figure named Yitskhok Pirozshnikov, the man who first popularized the concertina. Zemereshet provides all the Yiddish verses, but only a recording of the first verse in a Hebrew translation. הגדה של פסח מיט זשארגאנישער איבערזעצונג…און אויך א פסחדיקע לידעלע חד־גדיא מיט נאטן published by Pirozshnikov in Vilna in 1901. The composer of the song, Yitskhok Pirozshnikov, was an extraordinary man. 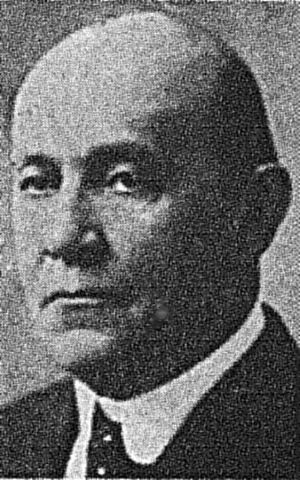 Born in 1859 on an island in the Dneiper river, Khortits, he became a kapelmeister in the Russian military in Vilna, and at the same time choir conductor of the Jewish Teacher’s Institute. He developed a new, easier way to play the concertina, allowing the instrument to be accessible to far more people. As a result all the Russian Pedagogical and Teacher Institutes in the region began to teach concertina. He was the first person ever to tour as a concertina virtuoso including Europe, America, Israel. He then left music for a while to set up a printing press in Vilna, and among his publications was the first collection of Yiddish proverbs in book form. In 1909 he came to the U.S. and became active in the Jewish music world again. He edited the music section of the Yiddish Forverts newspaper. He was the first conductor and choir leader of a Workmen’s Circle chorus in NY and then in Paterson, NJ. He composed at least 50 Yiddish songs for Jewish school children. No collection of his Yiddish songs appeared in book form. He died in NY in 1933. On the website Museum of Family History, in the section “Lives of the Yiddish Theater”, one can read more biographical information. 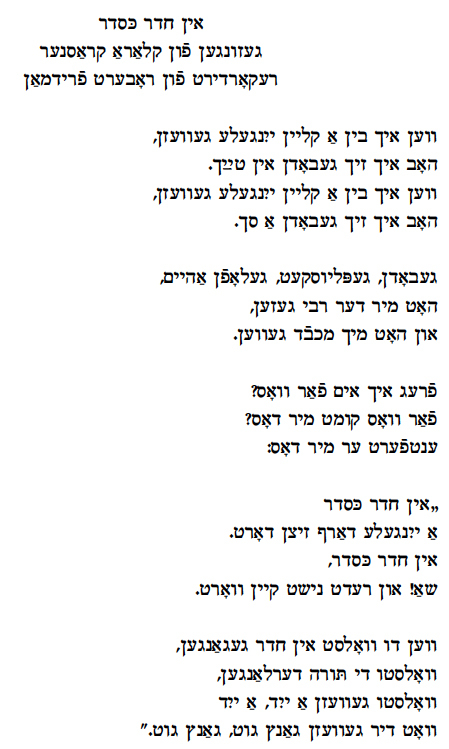 Below are the lyrics to Singer’s partial version, followed by the complete version by Pirozshnikov (since we do not have the original Pirozshnikov Haggadah, we have not changed the words as they appear on the Zemereshet website). zi shpringt arum in hoyz. un khapt un frest es oyf. Di tsigele, di tsigele, hert oys ovis-uvonim. un makht fun ir a sof. er iz dokh beyz un shlekht. un meynt er iz gerekht. listen up fathers and sons. she jumps around the house. and catches it and eats it up. The kid, the kid, listen up fathers and sons. The father paid for it two guilden cash. Khad-gad yo, khad gad yo. and puts an end to her. since he is so mean and bad. and thinks that he is in the right. un far kinder a fargenign. zi shpringt arayn in hoyf. un khapt un frest ir of. un meynt, az er iz gerekht. Refrain: Di tsigele, di tsigele…. zey zenen nit keyn por. un lesht im oys biz gor. zayn kop iz nor in mogn. Er kumt tsum vaser un trinkt es oys. ver hot im vos tsu zogn? funem oks iz nisht gevorn. iz nor farn khalef geborn. un gor nit oyf katoves. and for the children – a pleasure. as happens most of the time. and he believes, that he is in the right. they are not a pair. and puts it out completely. his head is in his gut. He comes to the water and drinks it up. Who is going to tell him otherwise? and the ox is no more. was given life just for his blade. and we are not kidding. to the angel of death. This is the third song we have posted by Clara Crasner, b. 1902 in Shargorod (a town near Vinnitsia, Ukraine). As she says after she sings the song, she learned this song in Romania approx. 1919-1920, where she waited for two years to get papers to come to America. Freedman recorded the song again, and this time she says that she learned it from a 5 year old boy. With its uneven verse lines and “un-Jewish” melody, In kheyder keseyder sounds as if it could be a newer Yiddish theater song of the time. Ven ikh bin a kleyn yingele geveyzn. Hob ikh zikh gebudn in taykh. hob ikh zikh gebudn a sakh. I bathed in the river [or lake]. Hot mir der rebbe derzeyn. Un hot mikh mekhabed geveyn. but the rebbe spotted me. So I ask him why? Why do I deserve this? a yingele darf zitsn dort. Sha! Un redt nisht keyn vort. is where a boy should sit. Quiet! And don’t say a word. Volsti geveyzn a yid, a yid. Volt dir geveyzn gants git, gant git. you could attain the Torah. And you would feel real good, real good. This song by Nitsa Rantz was recorded at the same concert as Rantz’s song Mayn shifl that we had earlier posted in in our blog, at the club Tonic on Manhattan’s Lower East Side in 2009. Rantz is accompanied by Jeff Warschauer on guitar. In their column “Lider demonen zikh lider” [Readers remember songs] in the Yiddish Forward newspaper, Feb. 7th 1992, page 15. 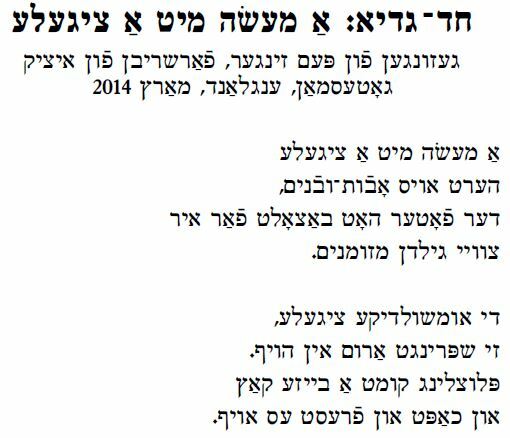 Chana and Joseph Mlotek printed the words of Nitsa Rantz’s version of this song. The columnists note that Rantz called the song “Viglid fun der frantzeyzisher revolutsye” [Lullaby of the French Revolution], and that they had found a printed version in a Workmen’s Circle songbook, 1934. A version was sung during the Holocaust in the Vilna ghetto and was printed in Shmerke Katcherginski’s collection “Lider fun getos un lagern”, 1948. The singer Rokhl Relis called it “Dos lid fun umbakantn partisan”. Instead of the guillotine, the father is killed in a gas chamber. 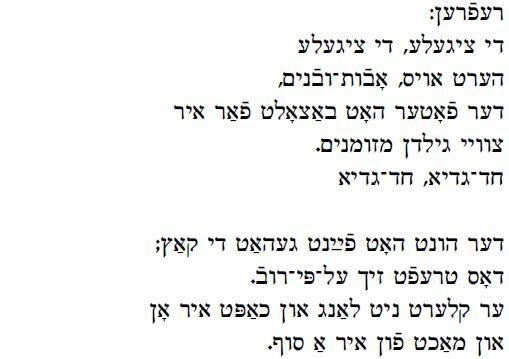 Beyle Schaechter-Gottesman sings a similar version to Rantz’s, and there is enough difference in the text to make it worthwhile to post it on the Yiddish Song of the blog at some point. A beautiful version is found in the Stonehill collection, sung by an as yet unidentified man, (Reel 9). Shlof shoyn kind mayns vider ruik ayn. Shtil es flit shoyn di levone-shayn. Kuk nisht kind af mayne trern. Sleep my child once more quietly. Quietly the moonlight flies . From the distance stars are twinkling. Child do not look at my tears. Es vet der tate mer nisht kumen. Im hot men fun undz genumen. Blaybn mir dokh eynzam kind aleyn. Your father will no longer come. They took him away from us. on the guillotine they cut his head. So we remain lonely, my child. vu es raysn zikh di klangen. Vu di shteyner zenen royt baflekt. where the stones are stained red. Tsu a groyser, sheyner, nayer velt. to a great, beautiful new world.